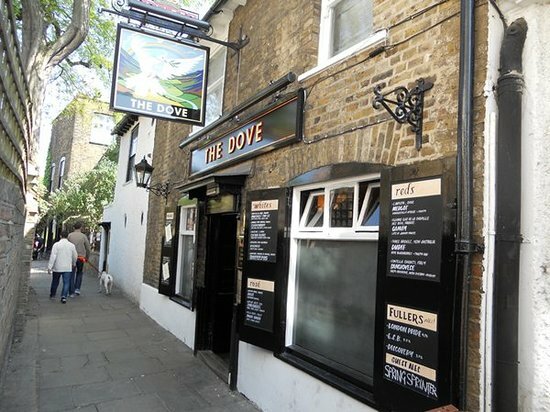 Favourites have got to include The Dove on the riverside in Hammersmith in West London. You will have seen this pub if you've ever watched the Oxford and Cambridge boat race on the TV. 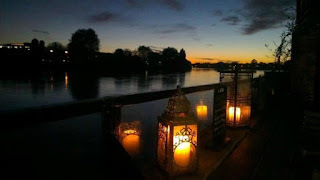 Just after the iconic Hammersmith Bridge, the commentators nearly always refer to "the riverside pubs" and very lovely they are too. The Dove is a fave as it has a big fire for when the weather gets cold and there is a riverside patio with great views of the wet stuff. There's been a boozer on this site since the 17th Century, the wifi is good and free, the staff are generally very friendly and it's a good place to get your head down and write or create. It has a space with a Guinness Book of World Record listing as The Smallest Bar Room in the world. The beer isn't that cheap, but of course, the location has an influence on that! The poet James Thomson composed the familiar strains of ‘Rule Britannia’ here. Apparently, Charles II romanced and dined his mistress Nell Gwynne here. And in the famous novel ‘The Water Gypsies’, author A P Herbert features it under a cheeky pseudonym; ‘The Pigeons’. It was a favourite of my Pappa too - Ernest Hemingway. Celeb-wise, the most famous person I've ever seen there is non other than J K Rowling! Like many pubs, it started life as a coffee shop and next door is the site of the iconic but not well known, Dove Press. There’s a great story attached to that as well. Maybe that’s for another post. Another winter fave next time. Brrrr!